This brisket recipe was inspired by a renowned 19th century Virginia beef barbecue cook named "Blackhawk." Yes, people in Virginia have been barbecuing beef longer than people in any other state including Texas and the tradition goes back to the 17th century. This recipe is my tribute to Blackhawk and all the other great, old time Virginia barbecue cooks that don't get their due. 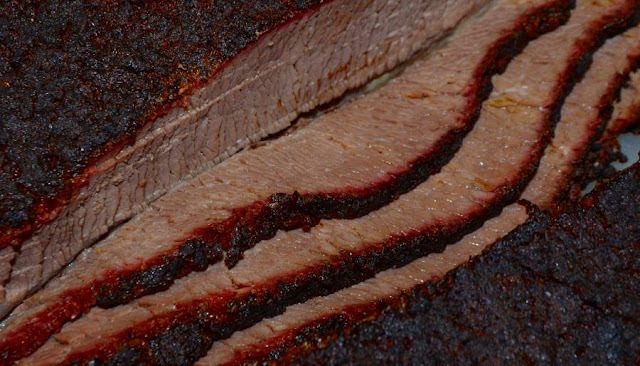 The biggest problem many have with hot and fast brisket is the bark. 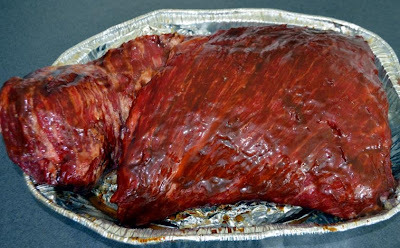 The bark on a typical hot and fast brisket just doesn't measure up to the bark of a brisket that has been cooked for 12 to 14 hours at a lower temperature. So, this recipe is my attempt to rectify that situation. I call it Blackhawk brisket. First, the basics: A good bark is the result of several things going on during the cooking process but one of the most important things is the Maillard reaction. This is where the natural sugars and proteins in the meat begin to brown while cooking. There are several main things that influence this reaction: sugar, protein, heat, and the PH level of the surface of the meat are a few. Start with a large full packer brisket. I don't usually cook full packer briskets smaller than 12 pounds. Trim it up and remove the excess fat from between the point and the flat. This is done to increase the amount of bark I would have on the burnt ends. For this process to produce the best bark you need to remove all of the silver skin and as much of the fat possible from the top of the brisket flat. Then, using paper towels, dry the top surface of the brisket as much as possible. Next, instead of keeping the surface of the meat flat and smooth, use a fork to cut some shallow "troughs" in the surface of the meat going in the same direction as the grain as shown in the pic. This is done in order to create more surface area for the bark to adhere to. And, as the great Adam Perry Lang taught us, more meat surface equals more Maillard reaction which means more flavor. The next important part of the process is to use something under the brisket while it cooks that will create a curved or slanted surface. This is important so that juices from the meat don't pool in one spot. The juices pooling will wash the rub off and eliminate any chance of a good bark developing. 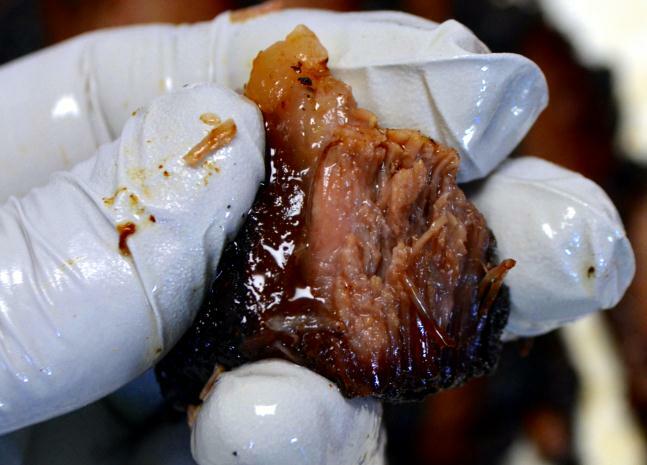 You can inject the brisket at this point in the process if you choose. Just make sure you let it sit overnight in the refrigerator to let the injection work its magic. After an overnight rest, again use paper towels to dry the surface of the brisket. The overnight rest isn't needed if you don't inject the brisket. Now, let's deal with the PH level of the meat. Sprinkle the top surface of the brisket with about 3 half pinches (just as much as can be picked up with thumb and forefinger) of baking soda. Yes! That's right! Baking soda! Just a light sprinkle all over the top surface of the brisket is needed. Don't use too much. After the light sprinkle of baking soda, apply a light coat of peanut oil all over the surface of the meat. The last step in this stage is to apply a light coat of molasses. I use the molasses as the base of the bark. It won't make the meat taste sweet. It just sits in the background and turns to caramel as the meat barbecues. Apply the rub all over the surface of the meat. Touch it up, if needed, by sprinkling some fine ground black pepper over the brisket to cover any spots that need it. While the prepped brisket rests, fire up your smoker to 325 degrees F. I use white oak chunks for smoke. Make sure your fire is burning very clean before adding the meat. The smoke coming from the chimney should almost be a clear vapor. Put the brisket on the smoker and let it cook for 2 1/2 hours. 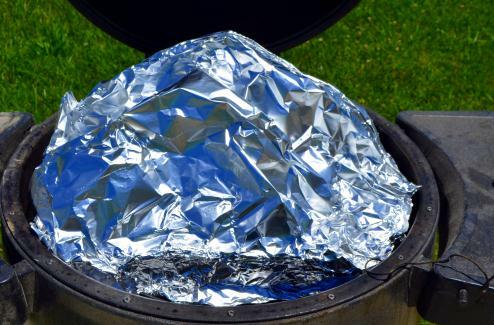 After 2 1/2 hours, Wrap the brisket with foil but leave some space between the foil and the top of the brisket much like a foil tent. Let the brisket continue to cook for about 2 more hours until it probes tender like "butta." I'd say the internal temp will be about 208ish F. But, please don't go by temperature alone. Make sure that if you peirce the meat with your thermometer that it feels like you are putting the thermometer through butter. 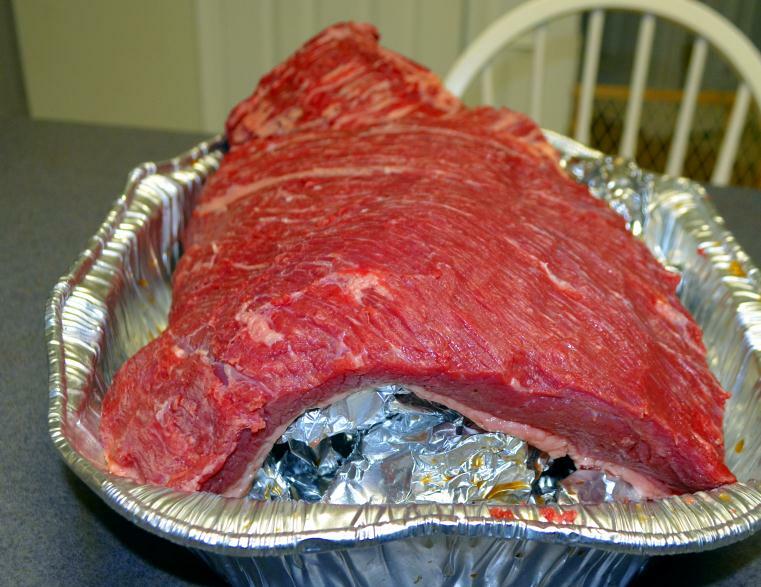 Once tender, remove the foil and let the brisket rest for 1 hour. Now, there are two main things going on here. The molasses is caramelizing while the surface of the meat is also caramelizing because it is experiencing the Maillard reaction. The baking soda raises the PH level of the surface of the meat. This is important because the higher PH level causes the Maillard reaction to occur quicker which means it will now occur longer than without using the baking soda. 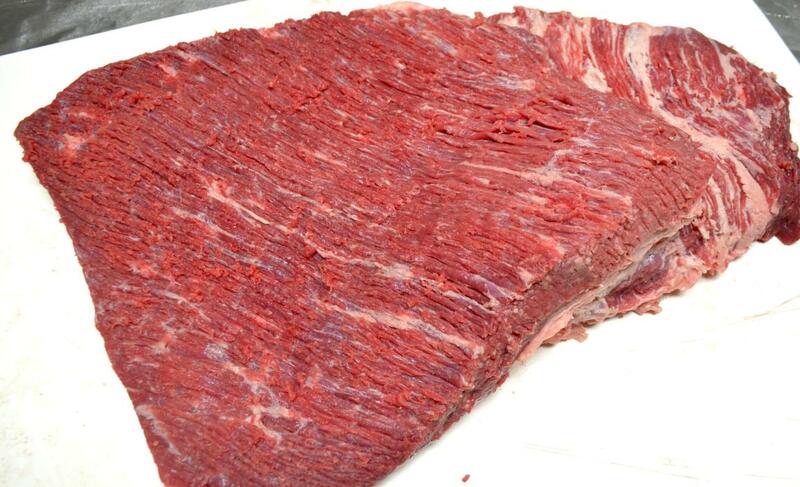 This produces a bark that is much closer to a long cook brisket bark than a typical hot and fast cooked brisket. If you doubt that baking soda speeds up the Maillard reaction, take a look at this video made by a friend of mine who also doubted it. He tried it while sautéing onions and peppers. And, Pitmaster T used way more baking soda than he needed. I find it real hard to believe that adding molasses to a brisket results in a non sweet cut of meat. Oh Yeah long live Texas. Please don't post pictures longer than 650px on the longest side. That sweetness may have gotten us a walk last weekend in brisket. I would rather never walk again Brother. I am pretty sure I will never know. Molasses is sugar. Sugar = sweet. The right amount of sugar is a good thing. Without sugar, there would be no Maillard reaction. Without the Maillard reaction you have dull, drab, gray meat without a crust. Whether you add a little to the rub or go with what is naturally in the meat, it's all the same reaction. 15 lb. Salt and pepper brisket no sugar cooked at around 250° panned and covered at 165° till probe tender total cook time about 8 hours. Notice the nice bark. Looks good, bro! Very nice! Don't get me wrong. I'm not a sugar evangelist. In fact, my preferred rib rub and sauce recipes have no sugar in them at all. But, without sugars in the meat, none of that great bark could develop. Even some great Texas places use sugar. For example, the basting liquid used at Snow's BBQ has sugar in it from the lemons and worsty sauce. It's not enough to make the meat sweet just as a TBS of molasses on a 15 pound brisket isn't but it certainly does help with the bark. 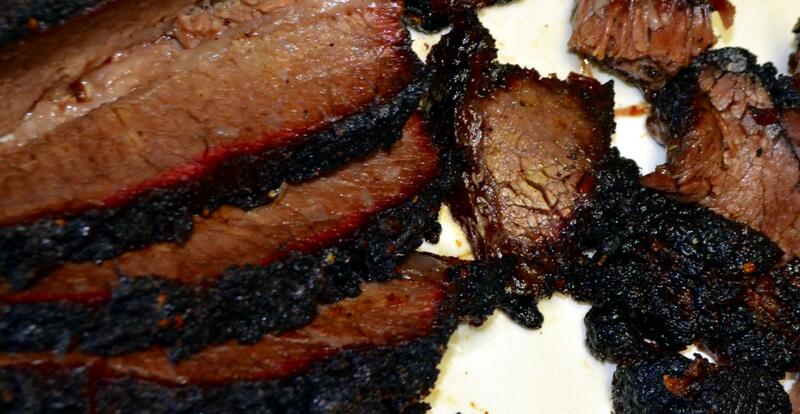 When you pan the brisket, which side of the brisket is facing down? The Flat or the Point? Papagallos, I cook my briskets fat cap down the entire cook. When it goes in the pan it is still fat cap down. I should have asked Fat Cap up or down instead of Flat or Point.